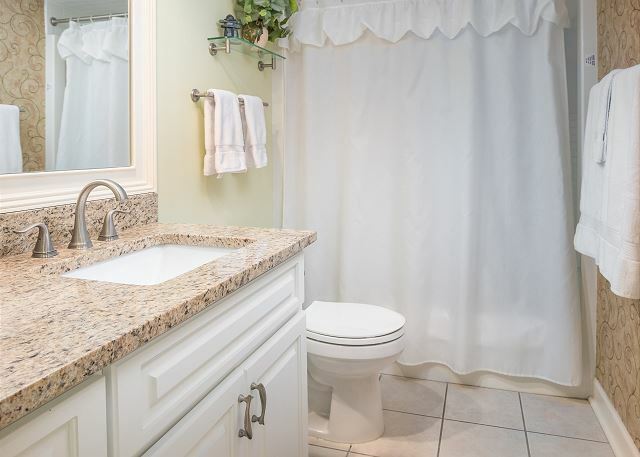 Looking for the shortest distance to the beach from your back door? This is the best choice for downstairs pet friendly! The beach is a very short walk from your back deck. The views are optimal too! Check out the pictures. You can see the dolphins from here! Once you go inside the coastal themed decor and comfortable furnishings create the perfect beach feel. For evening entertainment there is a large HDTV in the living room with DVD player. With high speed internet you can also stream your favorite shows if you have a Netflix or Amazon account. 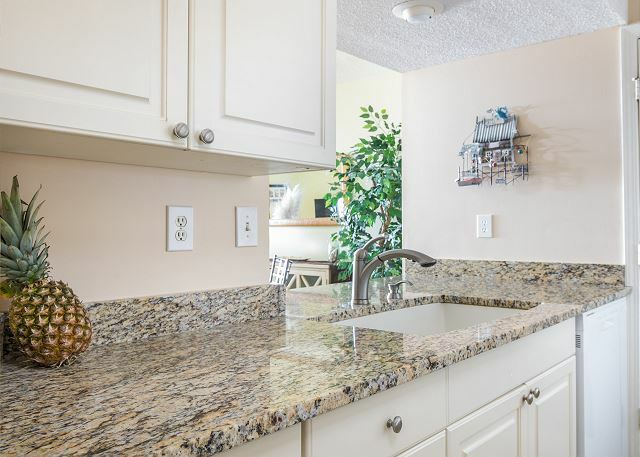 The kitchen is super nice with new granite counter tops, updated cabinetry and quality appliances. For a great night's sleep, the king bed is cozy and comfortable with new bedding for 2017 season. There is a flat screen TV here and a desk for your convenience. 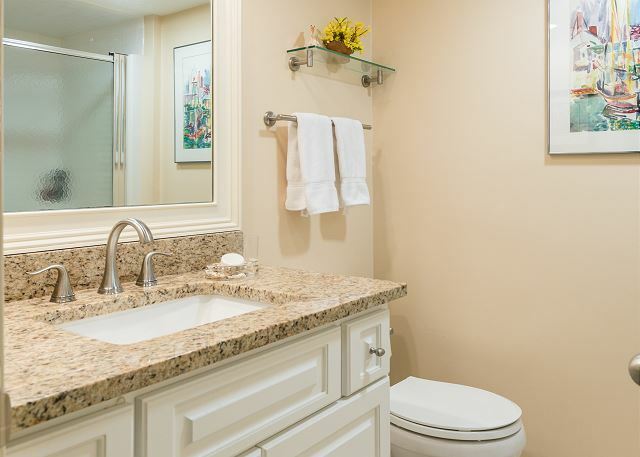 Both bathrooms are updated with granite top vanities. We know its hard to leave FIDO behind so we welcome your well behaved pooch to join you. Club amenity cards are included so book now for the best weeks! This condo is in a great location, not far from the beach, with a wonderful porch that makes you feel like you are on the beach! We enjoyed beautiful sunsets, watching pelicans and dolphins right from the couch. The condo was very clean and had all that we needed. This villa met all of our needs. 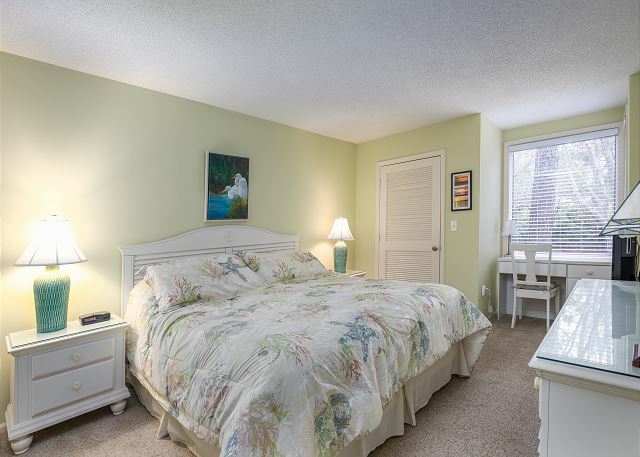 Great location with access to the beach and a very short distance to the pool. Very quiet and peaceful. Very clean and comfortable. Would definitely recommend. This is the second year in a row we have came to Seabrook as a family of 4 and we stayed at this particular condo for the second time as well. We absolutely love it! Nothing beats the view everyday. 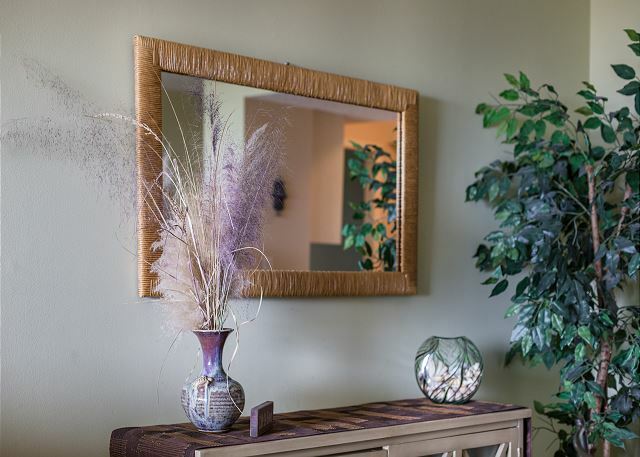 We thoroughly enjoy our time here at the condo has everything we could need and more! The distance to the beach is unbeatable. We rent bikes while we are there from Aligator Bike Rentals which is so convient. They deliver and pick up right to us. We love biking the Island all week long. The beach club is a short walk on the beach, or Rd. And a quick bike ride about .25 mi which is also super conviennt. Bohicket marina offers lots of fun for us. Captain Jack Sailing is amazing experience. Freshfields market offers lots of shopping and dining and we alternate between driving our car or biking the 4 miles. This is a great spot for a great vacation and amazing memories. Everything having to do with the villa and the Seabrook Exclusive people was wonderful. I questioned whether this area was oceanfront or riverfront. It was explained to me that the ocean and river came together right there and the ocean was visible whicj I saw. However, I still feel that the water meeting the beach was the river as there were no waves or the ocean breeze I have witnessed on other ocean front beaches. The beach seemed rather narrow which I guess was due to the time of high tides during the day. Overall though it is a beautiful area and we had a relaxing week. Very nice community with amenities very accessible. 45 mins from Charleston. If you’re looking for a relaxing stay in community vacation, this is the spot. Walls are semi-thin and can hear neighbors. The AC in the unit is also prettylod but other than that a great stay! 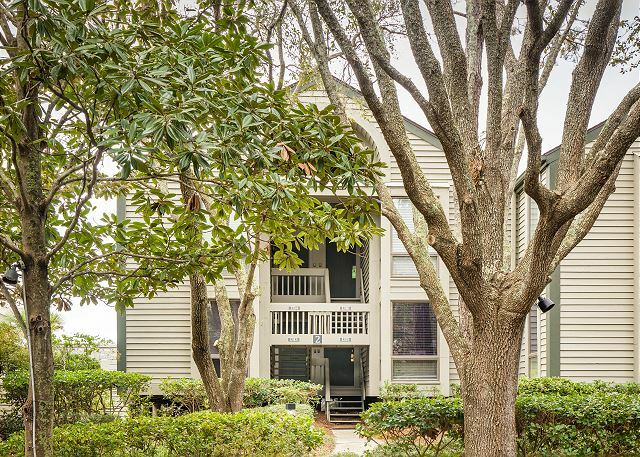 We have stayed on Kiawah for over 25 years and decided to try Seabrook. We absolutely fell in love with Seabrook. The villa was the perfect location for watching the dolphins and perfect sunsets! It was quiet and relaxing and everyone was super friendly. We will certainly come back. The villa was great. The only suggestion I would have is putting up a ceiling fan on the porch. And the pillows on the bed were too firm for us. But we loved our stay, everything about Seabrook and Pelican Watch. I have to admit that I was a little concerned when I booked this property. But upon arrival and walking into this villa I was amazed. It was absolutely spotless and very welcoming. The view was amazing and the walk to the beach was very convenient. Sunsets were beautiful. Saw something exciting everyday from Dolphins, horseshoe crabs, Sharks (only on fishing lines) to shrimp boats and sail boats. Awesome time. Highly recommend. Overall the time at this villa was nice. Our 1st day the air conditioning was not working, but fixed first thing the next morning as promised. Pictures were a bit deceptive. Much smaller than imagined. Sleeper mattress not at all comfy. Be ceiling fans and take bug spray. No can opener but was left one that afternoon. Perfect location! Clean and comfortable. Close walking distance to the pool and clubhouse. Beautiful view from the deck and easy 2 minute walk to the beach. We extended our stay by 2 days it was so amazing. Both the owner and the rental firm were great to work with. We will definitely be returning sooner rather than later. Very relaxing and reenergizing vacation. Only suggestion I would make is to add a ceiling fan on the porch to help with bugs. Or, at least have a fan to use indoors/outdoors. 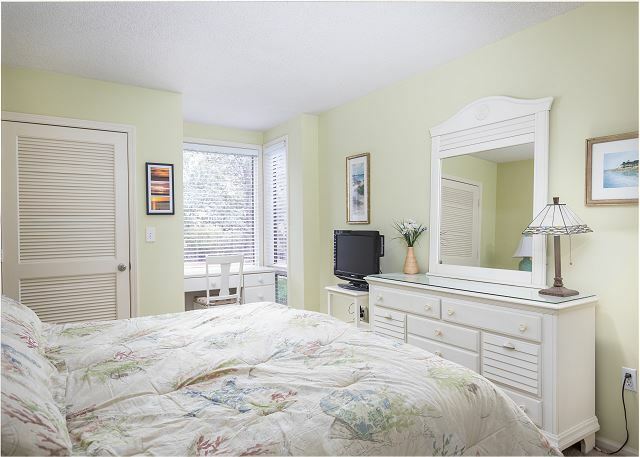 Beautiful location and updated condo. We look forward to returning. 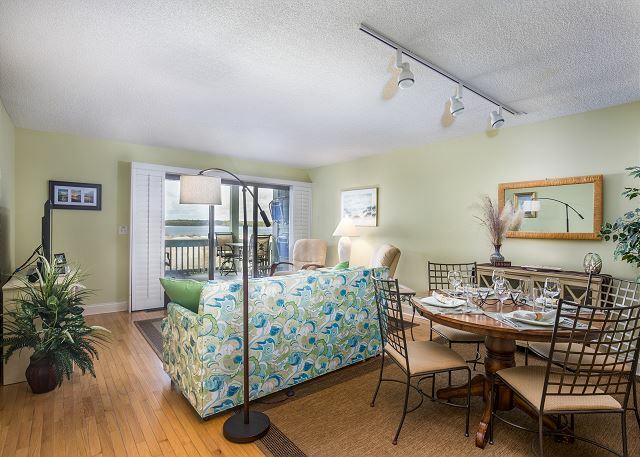 We loved this condo and Seabrook Island! My husband and I took our two children 12 and 5 yr old here for a one week trip and it was just as great as we were expecting. The beach is literally in your backyard. 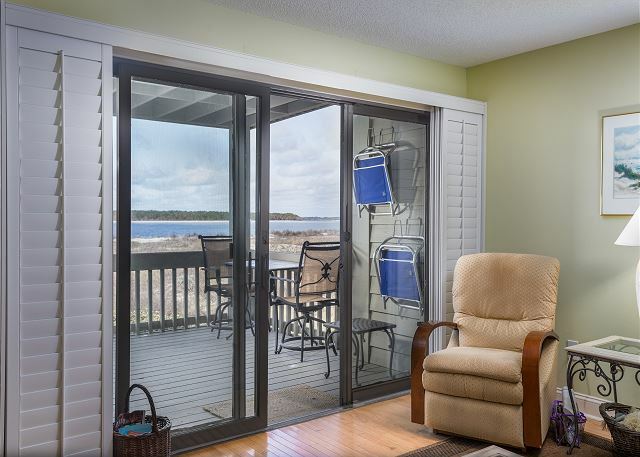 Perfect for packing a cooler and just step down off the deck to the board walk. Amazing views every day from inside the condo and on the deck. Beautiful sunsets. We rented bikes from Alligator rentals as suggested by the owners and they were great as well. We biked the island everyday. Ate at the beach club for dinner on Sunday night with live music. The condo was clean and comfortable and the second bathroom with a pull out couch made it possible with 2 kids. The kitchen was fully stocked (even a crock pot) with everything you would need for cooking any meal. It was truly a vacation we will never forget. We will be back. The owners were very helpful and answered all my questions quickly. Thank you!! Great place and fantastic location with so much to offer. Would highly recommend! It was close enough to visit all of the Charleston sites (also highly recommend!) Loved having the Freshfields Village so close by too - very handy! The only improvement needed is the security checkpoint. Pleasant staff, however, once checked in, you shouldn't need to wait in line to enter the community every time. Checked-in guests should have the ability to use the drive-through gate. Lots to do within the community, this is only an issue if you come and go a lot. You are steps away from the beach, very nicely done, we even prepared and had our Easter dinner on the deck. MY title pretty well sums up the experience my wife and had while staying at 1315 Pelican Watch Villa. Seabrook Exclusives where fantastic and met all our needs with the kind of customer service that we all want to experience, a great group to work with. The owners were very friendly and accommodating, they truly cared about your getting the experience that they promised. The facility was secure, extremely clean and was well equipped with the amenities you needed. My wife and I could not have been more pleased with everything. This trip was one of those experiences that we will have fond memories of for the remainder of our lives, and the professionalism delivered by all involved was a huge part of that. If you're planning a trip to the Charleston area, you really should give this facility a look. This is one of our favorite villas at Pelican Watch. It is convenient to the beach and very pretty. We have stayed at Pelican Watch condos for many years and love the area. The condo was clean and lovely and we especially love that we can bring our dog. The dog beach is a plus. Thank you for allowing dogs in this area. We stayed at Villa 1315 for a week in May - it was a lovely villa very clean and with a perfect view of the sunset. It was our first time in Seabrook and we were pleasantly surprised how much we enjoyed all the amenities and the island. We have already decided we will return again to this hidden gem in SC. My son, our poodle Beau, and I had a wonderful stay at Seabrook. The Vila was spotless, tastefully furnished, and ideally located. It was even better supplied than advertised (beach umbrella, umbrella anchor, crabbing nets). As noted there were in fact no food items at all including salt and pepper-which is fine as I prefer to use my own spices rather than mystery spices of undetermined age-just remember to bring salt and pepper. Never having taken a dog to the beach before I loved having all the dog supplies at the condo (tie out stake and lead, bowls, doggie bags with belt clip, bowl). The weather was cool but nice. Had the beach pretty much to ourselves. We all had a great time. I'm even considering coming back with my dog allergic son as the condo was so clean and most of the flooring is hard surface I think he might be ok. (I didn't leave him at home-he was at a youth event having fun while we gave the dog beach trip a trial run). A wonderful trip to relax and escape ! This is our third trip to Seabrook Island and stay at Pelicans Watch. Our villa #1315 was the nicest and cleanest place we have ever stayed at. It was in perfect condition and I'm immaculate. We were so happy to be there. Previous villa's that we have stayed at could not compare with last week at #1315. We ate breakfast every morning on the deck and then watched the beautiful sunsets in the evening . We will return next year to the same place. Fantastic villa, fantastic location...fantastic vacation getaway! In 2014 we rented 1315 Pelican Watch for one week over the Labor Day holiday, and had an amazing time. In 2015 we came back to 1315 Pelican Watch, but for 2wks instead of one. This place meets every single expectation we have, and then some. It is the perfect vacation - the location, the beach, the villa, everything. I can't say enough good things about Pelican Watch and Seabrook Exclusives. This will be an annual vacation for us!!! This is our 8th year coming to Seabrook. By far our favorite south east beach location. This is our 2nd time using Pam Harrington Rentals and they are the best to rent through !!! We loved 1315 Pelican Watch. The unit was clean and well stocked. This is a pet friendly rental and our dog loved the beach and seeing the deer in the dunes. Sleeps 4 comfortably. The kids loved waking up with a view of the ocean. We also rented paddle boards for the week and it was great to walk them down to the beach every day... The view was amazing and we loved being so close to the beach. We have stayed at Atrium several times as well but like this view and proximity even better. We would put this unit on our list for use again this and next year for sure !!! 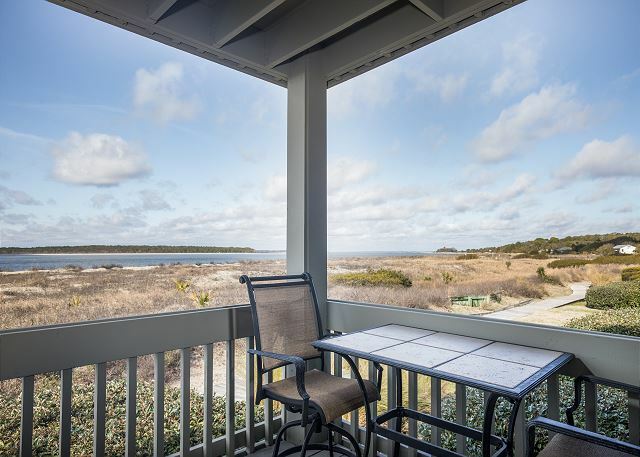 Seabrook Island is truly a beautiful well-planned community and this property is no exception.. It was nicely decorated, clean, with all amenities. We visited in October (one of our favorite times of the year at the beach). Every morning I enjoyed a long walk on the beach and enjoyed the company of wildlife in a peaceful,safe setting. After my walk, coffee on the deck/porch was wonderful. I would definitely recommend Seabrook Exclusives for future visits to the island. They were extremely professional and attentive to all details. Having Freshfields Market nearby only added to the experience. We rented this condo for our honeymoon and were more than pleased! We have always stayed in a top condo because we wanted a good view but this view was just as good if not better! Having a first floor condo is also very convenient for unloading and loading your vehicle! The living room was spacious and the kitchen had everything we needed. The bed was extremely comfortable! We loved having a master bathroom but it was also nice to have a second bathroom in case we both needed one at the same time. Everything was super clean and absolutely perfect! We even had to contact the owners after we left because we left a few things behind and they were very helpful in getting our things back to us! Wonderful Time at Pelican Watch! I can't think of one single thing to be even slightly unhappy about...from my first siting of the property via Google to actually checking out. The office staff was knowledgable and pleasant to deal with, the property was better than I expected and the views were spectacular. My husband and I enjoyed a great vacation in this very clean and well appointed villa. We were able to bring out small dogs which made it even more fun! Everything you need is right at your fingertips and the beautiful neighborhood adds to the vacation feel. We will most surely be back! The condo was updated and clean. It was right on the beach and in an excellent location. We were overall very happy with the experience. We had a wonderful time at Seabrook Island! The island is beautiful! This is such a beautiful, peaceful, serene environment to relax in, with many active opportunities available as desired. Very clean, comfortable, in a great location. The condo was very clean, well maintained, with modern updates, and the best sunsets ever! This was our 2nd trip here, and we'll be back for sure! Can't beat the view in this cozy condo!It had everything we needed. The best part was the convenient access to the beach. We also liked our first floor access, however getting a top floor condo maybe the way to go if you don't want to hear foot steps all the time above you. Although it was a coast to coast trip for us we would do it again just to lie on the beach and watch the dolphins swim by. We just returned from a 1 week stay at 1315 Pelican Watch. 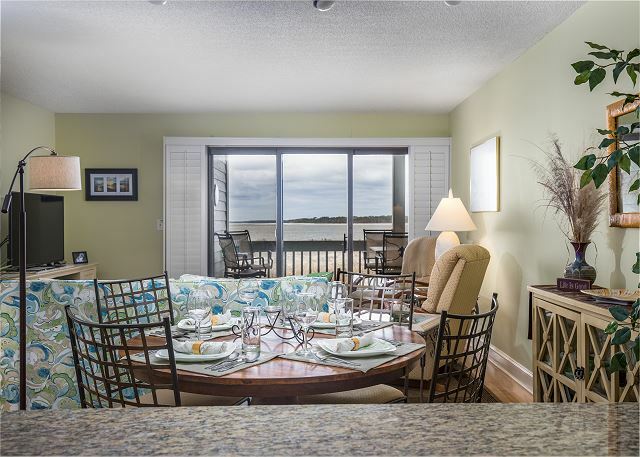 The condo is amazing and our vacation could not have been any better... We loved Seabrook Island and appreciated Seabrook Exclusives calling to check in with us upon arrival. From the very beginning we fell for the beautiful decor and location, but ultimately chose this rental due to the many (over 60) positive reviews and let me say that we found it to be even better than expected. The rental process was straightforward, and correspondence with Janet (owner) and Seabrook Exclusives was very easy. Check-in with amenities office went smoothly. 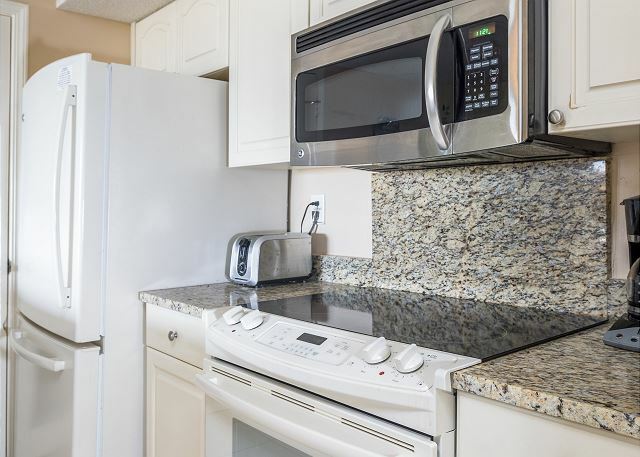 Parking is just steps from the condo and the unit is very well appointed/cared for. 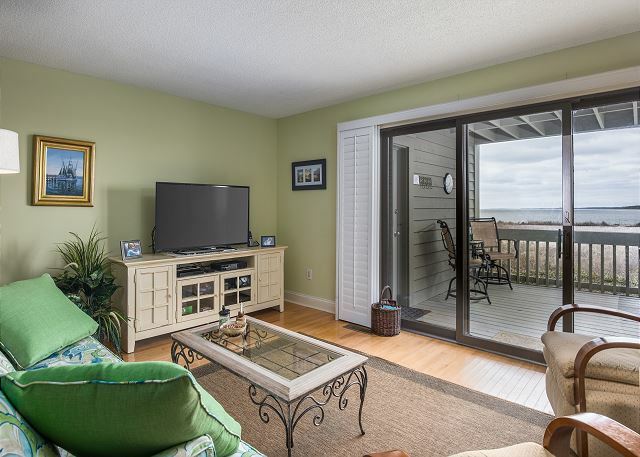 The unit has amazing ocean/beach views as well as nightly sunsets and a covered deck (only 1st floor units appear to be covered and allowed for cool enjoyable use throughout the day). The Beach Club is great, it offers two wonderful pools, a kids club, an arcade and nightly family friendly activities (bonfire w/ s'mores and movie night). We couldn't believe all the wildlife on the island, we saw squirrel, bunnies, armadillo, deer and dolphin. We were told that the absolute must see of the island occurred near beach entrance/path #1 and that this was one of only a few places that it was known to occur... dolphins feeding onshore! The dolphin surround the fish and push them up on shore about 1-2 hours prior to low tide and then come partially up on the sand to feed.. It was AMAZING !! Freshfields Village is conveniently located near the entrance to Seabrook and provides an inviting seaside village experience with shops, dining, concerts on the green, movies on the green and a weekly farmer's market. The Pelican's Nest at the Beach Club provided a great meal at an oceanside table. Thanks for a great vacation experience. I can not wait to return. We went on May 13th and it seemed to be the perfect time, there was no one else there! And the weather was perfect, the beach there is so beautiful. Everything was great! Of course there are those extra charges (like to use the pool and the fitness center, but I guess that is to be expected). The fitness center was very nice and so were the people. We loved Rose at the front desk. Also, shopping, restaurants and rental stuff is all very close. Drive to Charleston is very easy. Comfy Villa and Spectacular Views! This property is on an ideal end of Seabrook Island - the villa is comfortable and well equipt - the amenities on the island are ideal. Beautiful view, nice clean condo. Would stay again! I love returning to Seabrook Island each year - I can always count on marvelous scenery, courteous staff, and lots to see and do in the area (or not if you just want to relax)! Thank you for offering a dog friendly condo for rent. Our dog had as much fun as we did. Everything was perfect for us. Has a wonderful time on Seabrook Island for one week. Saw wildlife, sat on wonderful deck, took long walks, didn't even use our rented bikes, enjoyed great dining options and had a fabulous time. The condo was perfect - comfy, clean and plenty large enough for the two of us plus our dog. 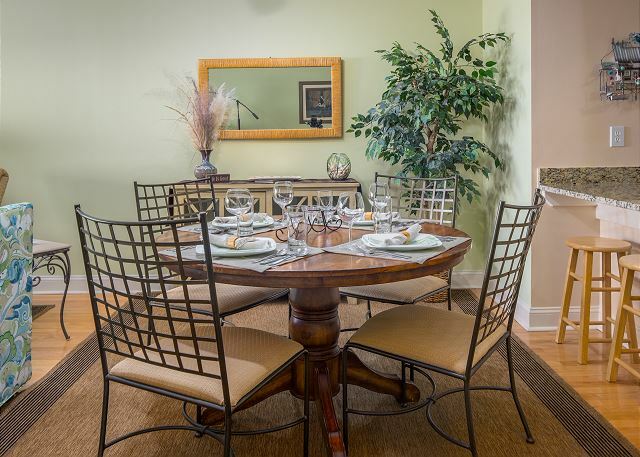 We highly recommend this condo! The pictures do not do this property justice! We had a fantastic time, and our dog loved it too! Providing helpful information about the area/restaurants and the doggie bags was an added plus! We will definitely be back. 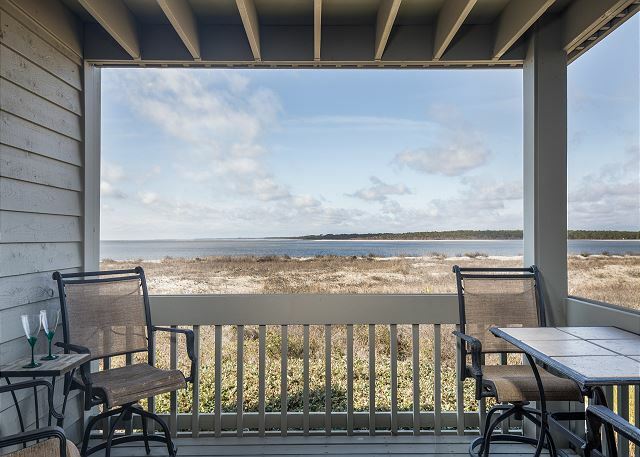 This was our first experience at Seabrook Island, and we were very impressed with the rental condo and the management experience. It was just as described. North beach is the prettiest beach on the island and the best for kids. Other beach has too much wildlife and no waves. Once again the time spent on Seabrook Island was very relaxing and enjoyable! 1315 Pelican Watch was a wonderful place for a weeks stay. Easy beach access from unit. Great view of sunset from back deck. Pool at Beach Club is nearby. Bicycle rentals at Seabrook are very easy. We hope to return next year. We have been visitng Seabrook Island for quite a few years and love that it is not commercial and the beaches are quiet. We also enjoy the "dog beach" and so does our furry companion. The villa was clean and decorated beautifully. Had all the things needed for the week. Our condo was very clean, well stocked kitchen. Even a slow cooker for a late meal! Everyone is very nice and helpful, location is Super. Close to it all, Bed super comfy.. Loved it, will be returning! This was our second time to 1315. We may do a third next year. Great place. We made the most of our break from the crazy busy world selecting this property for our break. The property made our top 10 list. Seabrook is a great place to go and do nothing but enjoy the beauty of the island's nature. The only distraction that we experienced was the unit is on the first floor and for two nights we had people and three dogs on the second floor moving around late into the evening. The sound proofing between the floors is limited. This was our first time on Seabrook Island and we loved it! 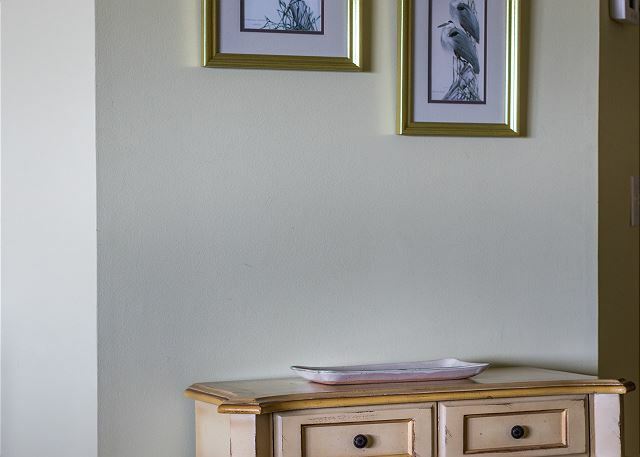 The private community offers a peaceful place for walks on the beach and for watching wildlife. We saw deer, ducks, turkeys, pelicans and dolphins every day. What a wonderful place to relax. The villa was clean and had comfortable furnishings. The beach was never crowded. Nearby Freshfields Village was a great place to shop. The Harris Teeter grocery store was more than adequate for most grocery needs. Try the shrimp salad at the deli. It is made fresh and may very well be the best seafood salad I have ever had. We will definitely plan to return in the future, but next time we may have to stay two weeks instead of one. We enjoyed our stay at Seabrook Island very much. Our villa was so clean. We had the whole beach to ourselves one day...very relaxing! I can't wait to return in the near future. We had an awesome time! Pelican Watch was perfect for our family. The water is calm and the beach was clean and safe. Perfect for our 3 year old son. The condo was beautiful, clean and modern. Better than the pictures posted on the website. We loved our time in Seabrook island and wish we didn't have to come home. Seabrook is a wonderful place to relax and unwind, yet close enough to Charleston for sight seeing. The villa had all the amenities we needed, and the view was great. Seeing four deer on the dunes just off the balcony was awesome. Excellent Stay -- Great Vacation Property! All the villas on Pelican Watch offer excellent ocean views and great amenities. Our villa was comfortable, nicely decorated, well appointed, and extremely clean. Potential guests should be aware that the King bed is extremely firm. It is rare to find vacation properties that offer such wonderful accommodation yet are also dog friendly. Even the beach (steps away from the villa) is dog friendly. My husband and I spent a wonderful week enjoying: the ocean views and deer from our villa balcony; day trips into Charleston; outings to Freshfields Village and Bohicket Marina; daily walks along the beach, nature paths and roads; workouts at the fabulous Lake House; and the occasional meal at Island House & Beach Club. Our only negative observation is that there are no sidewalks on Seabrook Island. Pedestrians and cyclists share the road with motorists who are expected to drive slowly. Many motorists do not adhere to the speed limit and don't "share the road". We had several close calls on our daily walks. This is our second visit to Seabrook Island Pelican Watch and we look forward to many more future visits! Everything was wonderful. We have a great time and enjoyed watching the deer each morning from the balcony. Location was convenient to things to do, yet very relaxing and peaceful. We will come back. Visit Seabrook every year at least once, and Fall is a very quiet, peaceful time of year to visit. Weather a bit more unpredictable, but very nice. Bugs can be an issue this time of year though. This unit was tasteful and comfortable. We enjoyed the view from the deck a lot. It's a nice drive to Charleston and area attractions. The location on the beach is terrific. We especially enjoyed sitting on the porch watching birds, listening to the waves, and walking the beach. It was very quiet otherwise. The unit inside and out is very comfortable and well maintained, as described on the website. We very much appreciated the driving directions and restaurant suggestions provided by Janet. We also received a call from the property manager the evening we arrived to see if we had any questions. Amy was very helpful and stopped by the next morning with the extra key that was not immediately available the evening we arrived. The unit was very nice. Seabrook Island is a great area, and has been greatly enhanced by the addition of the Lake House facilities, which we used every day. The Freshfields Village is a delight - good shopping and visually very satisfying. The Seabrook Exclusives people were friendly, helpful and a delight to interact with. We certainly hope to be back. We loved the unit we stayed in. Loved the hardwood floors, the all-weather carpets, and the very comfortable furnitire. The unit has everything you need and nothing you don't. We loved our view and saw deer, pelicans & all the sea birds, and dolphins from our porch. The moving shutter panels are brilliant---you can block out the direct sun and keep the rest of your view!! Water pressure was great. The beach club was right around the corner---so you can sit on your own porch, or go up to the club for a lounge chair and full sun. Much enjoyed having a bike for a few days. It's a very pleasant ride around the island. Cost of everything on the island is reasonable except golf. We left the island for golf. Recommend Shadow Moss Plantation (under $50) and Patriots Point (under $100) with views of Charleston Harbor. Will probably do it again and again. We loved everything. We were disappointed that we arrived after the office closed and had to wait two days for our amenity card--missed out on brunch at the club. All else was nice. Our dog loved the beach. Wonderful weather, beach, & stay. This is our 3rd year! A little bit of peace away from the hectic pace of normal life. Seacoast Exclusives was very professional in every way. Location and direct access to the beach were excellent.